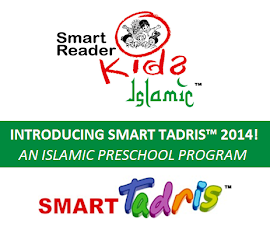 Smart Tadris™ is a new programme introduced in addition to the multiple award winning Smart Reader Kids® program. This programme emphasizes modules pertaining to religion to complement young children's early education at pre-school level. It offers a complete Islamic learning foundation based on six articles of faith in Islam ('Rukun Iman'), so as to equip Al-Quran literate children with relevant religious background. Based on the 'love' concept, it will help children to appreciate the greatness of Islam through education. Along with tagline "Towards a Smart Muslim Generation", the Smart Tadris™ programme highlights the basic knowledge of Islam in a wholesome manner, by means of the latest methodology in the realm of education. Each preschool class size is 12:1. We maintain small learning group per class to ensure every kids get individual attention from our teachers. Apart from Islamic Teaching qualification, the 'Islamic Teachers' will be well trained by the Corporate Trainers which is conducted by the JAKIM. They will be exposed to the creative methodology teaching method to ensure this program are delivered to the children in exciting ways, nurturing towards Islamic foundation preschool teaching. They will continually introduce ways in communications and enhancing their skills by reading, combining ideas and experimenting to keep the class presentations lively and invigorating. Aside from the conducive environment setup, our mini library now will also be equipped with various children Islamic reading books and materials to complement Smart Tadris™ program. 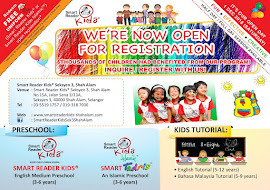 The monthly fees for Smart Tadris™ Islamic preschool program is RM295/month. Please contact us to learn more about Smart Tadris™ Islamic preschool Fees. As a side benefit, students of Smart Tadris™ are also entitled for the Privilege Card at no cost which can be use to retrieve discounts from our merchant partners. Leveraging with the multiple award winning Smart Reader Kids program such as Smart Reader English®, Smart Bacaan and Smart Maths together with the Islamic preschool learning, the children are to benefit greatly from the Smart Tadris™ program and set to move towards becoming a Smart Muslim Generation. REGISTER with us! or Try our 5-Days Free Trial!